Keep muddy, drippy shoes off the floor and on something vibrant. These small shoe trays look great, keep the floor clean, and make kids and adults want to stay tidy. The flexible grooves catch water and are easily washed off. Dimensions: 9.84" x 9.45" x 0.47"
Maker Susanne Ritcher reinvented the shoe tray and it’s happily unrecognizable. 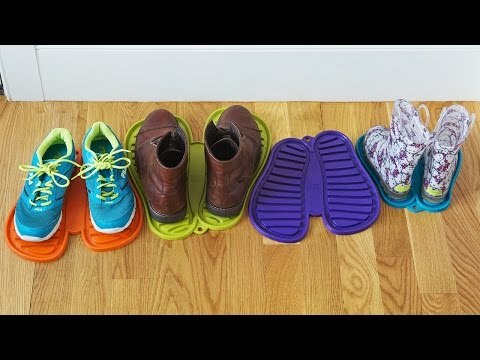 Flexible and brightly-colored, these shoe resting places make it easy to stay tidy. Place your wet, muddy shoes on the footprints and keep your floor clean. The mats’ grooves help trap dirt and water—plus, they’re designed to easily wash off in the sink. Susanne wanted something that would preserve her floors and match her home’s modern interior. After asking friends to try it out, she realized her idea wasn’t just practical but also didactic—kids can each have their own color and specific spot to place their footwear. Shoo.Pad’s vibrant design incentivizes tidiness and teaches organization to kids and grown-ups alike.